The only truth lies in the joy of telling, the art of being a storyteller. Raoul Walsh always insisted that his films were for entertainment. None of that artsy stuff. In a way that was true. His best skill was simply knowing where to place the camera, how to catch the action so that it looked as exciting as possible. There was often depth beyond the forward thrust of his stories though. They were never quite as simple as he claimed, often leaving a moment for reflection, and space for characters to grow, especially with his later works. 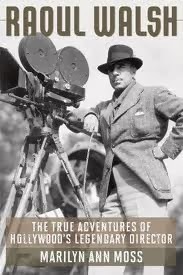 In Raoul Walsh: The True Adventures of Hollywood's Legendary Director, now in paperback, Moss reveals a man who was somehow both complicated and straightforward. It couldn't have been an easy task to write about his life, because he loved his tall tales. Who better to tell stories for a living than a guy obsessed with creating his own legend, all to the delight of the media which encouraged him? Walsh loved his work, always getting right down to business and finishing his shoots ahead of schedule, acting like a gleeful child during the filming of wild action scenes. He directed (and sometimes acted) from the silent age to the last days of the studio system and would have done more had age and dimming eyesight not stopped him. He could just as easily lose interest in his work though, reading the racing forms instead of paying attention to a less thrilling scene; ripping pages out of a script to avoid falling behind or just so he could make it to the horse races. His actors were unnerved by his habit of looking, and sometimes even walking, away once he began filming a scene. He'd never looked through a camera lens. If the dialogue sounded right, he moved ahead. Romance was equally complicated for Walsh. He was at first loving and then distant with his first two wives, actress Miriam Cooper and Lorraine Miller. They'd lose out to the races more often than not. Horses may have been the true love of his life. 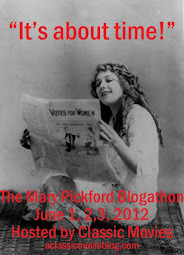 And yet, he met nineteen-year-old Mary Simpson in his late fifties and fell deeply in love with her. He was still a scoundrel, but remained devoted to her over thirty-three years of marriage. His adopted sons and stepdaughter also struggled for his attention. Walsh was an absentee father, something that didn't seem to trouble him in his youth. In later years, he seemed to regret not having his own children. Moss weaves all these elements into a rich portrait. You can feel how alive Walsh was, how passion drove him towards excitement, whatever the cost. She finds the truth wherever she can, but does not shy away from the legend. After all, the way Walsh saw himself is an important part of who he was. Often when I read a biography, I might get a bit of a thrill learning how a director or performer sculpted their career, but I become impatient to get the to films I know. This was not the case reading about Walsh. His career was wildly exciting. He jumped right into the silent age, both acting and directing. Gloria Swanson handpicked him to helm her own production of Sadie Thompson (1928), and she insisted he star opposite her as well. He had a huge crush on his married leading lady, but couldn't bring himself to act on it. Walsh's efficient, brisk style behind the camera was a perfect fit for crime films like The Roaring Twenties (1939) and High Sierra (1941). He loved tough stars like James Cagney and Ida Lupino. He had no patience for George Raft's imperious demands, which ultimately led to his decline. And Bogie: Walsh knew he had chops, but he couldn't stand the way he complained about everything. Though crime and action are the genres that made Walsh's reputation, he tried a bit of everything. From early musicals to comedy, he applied the same clear focus and hard-driving momentum to them all. He was a good match for the bawdy Mae West with Klondike Annie (1936). In his personal favorite, The Strawberry Blonde (1941) he tenderly explored the past as he would like to remember it and his enduring belief that whatever happened, romance was of deep importance. There's a story in the book that perfectly captures the Walsh's tough, but romantic nature. While directing Saskatchewan (1954), he became irritated with Shelley Winter's behavior on the set and allowed another actor to handle her roughly during the filming of a scene. And yet, he knew that the actress was pining for her husband, Vittorio Gassman, whom she had just married, and rearranged the schedule so that she could return to him as soon as possible. Contradictions like these give Walsh's story lots of spice. It's an entertaining read, both the fiction and the non-fiction. Many thanks to University Press of Kentucky for providing a review copy of the book.